Black Pointe Shoes are needed for many ballet performances. 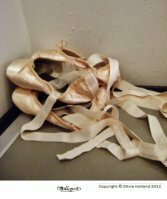 It is not only the traditional satin colour which is worn by professional ballet dancers, so if you need to supply your own pointe shoes in a different colour, then discover the possibilities here! Pointe shoes are easily available in the standard colour of pink, but what if you need a different colour? There are many vibrant ballets today which have red, silver, white and even yellow pointe shoes! Checkmate is one production where the ballet dancers wear black pointe shoes. Checkmate is regularly performed in the British ballet repertory. It is known as Ninette De Valois' signature ballet. De Valois is a vey important figure in the history of ballet and greatly influenced English ballet. Here are some tips I'd love to share if you need to get your pointe shoes in another colour! How do I get black pointe shoes? To start off, in a professional ballet company, sometimes the wardrobe shoe department will organize your pointe shoes and dye them for you. However, this is not always the case! I've seen many professional dancers (including myself) who colour the pointe shoes themselves using a black permanent marker. After being with one ballet company who dyed the pointe shoes for me, I'll admit I was slightly surprised at first when I saw the dancer's colour the pointe shoes themselves with a pen... but it did work! It took a lot of time, but it did the job. You can also dye the shoes yourself. Personally, I have not done this myself but I do know they slightly shrink when using dye. Therefore, I would say half or a quarter size up would leave you enough room for them to fit. If you want it professionally done, then make a special request to your pointe shoe brand and see if they will supply the shoes in black for you. It is always worth to ask. There are also many websites online that supply pointe shoes in black, such as Ebay, they currently sell brand new black shoes in all sizes. Many classical ballets use colourful in pointe shoes like Elite Syncopations. This ballet is choreographed by Kenneth MacMillian and it's glorious production, particularly because of the colourful costumes and vibrant scene. The lead dancer wears pure white pointe shoes, whilst the other dancers wear a variety of pink, yellow and purple pointe shoes. Other ballets which require coloured pointe shoes are Pineapple Poll and The Dream. Whether you want colourful pointe shoes for fun, or an upcoming performance you can find a solution. Either a DIY method, or contact your pointe shoe brand to request another colour.